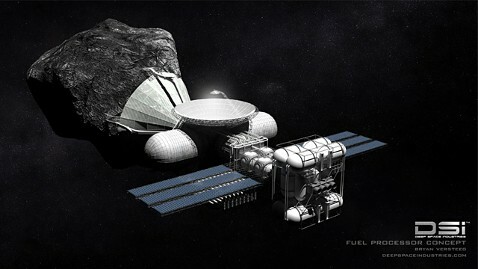 Artist's rendering of asteroid-mining spacecraft. Image: Bryan Versteeg/DSI. A small group of entrepreneurs has big plans - literally, to mine the sky. Deep Space Industries (DSI), a new company in California, announced today that it hopes to build a fleet of asteroid-hunting spacecraft and launch by 2015. The ships would explore nearby asteroids for resources and use them to benefit Earth. "We sit in a sea of resources. It's not something we can sit back and dream about," said Deep Space chairman Rick Tumlinson. "Using low cost technologies, and combining the legacy of our space program with the innovation of today's young high-tech geniuses, we will do things that would have been impossible just a few years ago." Those things that seemed impossible include building what they are calling "FireFly" spacecraft, to capture Near Earth Asteroids - asteroids that cross the Earth's orbit or come within about 300 million miles of the Earth. DSI says it is working with NASA and other companies on the effort. The robotic ships would come in different sizes, traveling in space for two to four years and returning up to 150 lbs. of material. "This is the first commercial campaign to explore the small asteroids that pass by Earth," said Tumlinson. However, that's only where the journey begins. Deep Space plans to mine the asteroids to transform the raw materials into complex metal parts, and added the amount of asteroids has only increased over the years. "More than 900 new asteroids that pass near Earth are discovered every year," said the company's CEO, David Gump. "They can be like the Iron Range of Minnesota was for the Detroit car industry last century - a key resource located near where it was needed. In this case, metals and fuel from asteroids can expand the in-space industries of this century. That is our strategy." Mark Sonter, a member of DSI's board of directors, said many asteroids consist of asphalt-like metal and nickel iron metal. He described these components as "extremely valuable material" and "will be a major resource opportunity of the 21 st century." "Mining asteroids for rare metals alone isn't economical, but makes sense if you already are processing them for volatiles and bulk metals for in-space uses," said Sonter. Does the company have a chance of success? Many space-business ventures have failed; a notable exception is SpaceX, which has a contract with NASA to launch supply ships to the International Space Station. DSI also has competition in the space mining business; last year a company called Planetary Resources announced similar plans - and said it had backing from Larry Page and Eric Schmidt of Google, Ross Perot Jr. and James Cameron. Deep Space says it does have some investors for the campaign, but added that today's announcement was made in hope of attracting more.